Introduction – Haveri is the district headquarter of the district bearing same name. Population of this town in 1872 was 5,465 which grew to 5,652 in 1881 as reported in Bombay Gazetteer. Population in 1951 stood at 18,666 as per Dharwad gazetteer. As of 2001 India census, Haveri had a population of 55,900 which grew to 67,102 in 2011 census. Haveri has been associated to the legendary king Nala of Krtayuga. According to an inscription (no 7 of the article), Nala excavated a tank but a snake came up as an obstruction to the running water. Nala tried to control the snake. When the latter came on the surface of water, the king said ‘Pav-eri’ (Pav = snake, eri = mounting up) and the snake climbed up. Following this event, the town came to be called as ‘Pavari’ which later became ‘Haveri’. Haveri was also known as Nalapuri according to inscriptions. According to a legend, it is said that king Nala, dreamt a dream in which the local tank burst into flood and the whole town was about to be swept away. At that time a large snake came and lay against the flood forming a bund and stooped the flood. Therefore, the town came to be known as Haveri (Havu + keri = place of snakes). Haveri was situated inside Banavasi-12000 during the times of the Western Chalukyas and Kalachuris under them. The town was very much patronized by the Suena rulers as many inscriptions of theirs are found here. Surprisingly there is no Vijayanagara inscription found here. The Bombay gazetteer mentions the sprawling cardamom trade in the town. No cardamom was grown locally, but it was brought from Kanara uplands, washed here at Haveri and then sent to Dhundshi, Hubli and Mysore. In Haveri, was a small well of brackish water impregnated with lime and possessing bleaching properties. The bales of cardamom imported from Kanara were washed in this well. When dried, the husks become of a light cream color. This trade flourished till the early fifties, but industrial advancement rung the knell of cardamom trade. Inscriptions – Dharwad gazetteer reports thirty-two inscriptions found at Haveri. Twenty-eight of these inscriptions are published in South Indian Inscriptions vol XVIII. Inscriptions can be found here. 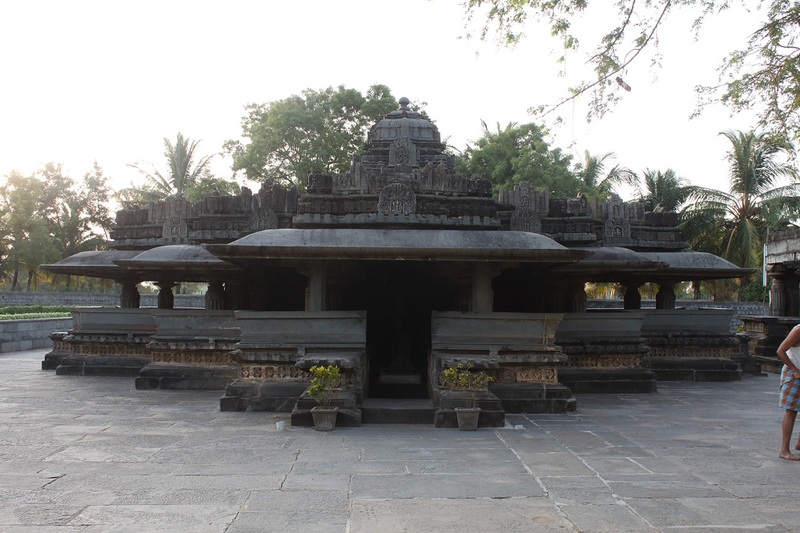 Monuments – There are many modern temples in Haveri. Siddheshvara temple is one of the oldest in the town. Siddheshvara Temple – This west facing temple is a ek-kuta (single celled) structure. The temple is comprised of garbha-grha, antarala and ranga-mandapa. Around the temple, over the vimana, are carved various sculpture such as Varahi, Lakshmi, Kali, Bhairava, Surya, Maheshvari, Kaumari, Ganesha etc. Presence of various matrikas suggests the probable Shakti affluence over the temple. Antarala is as big as sanctum and is square in design. Its western doorway has Hindu trinity, Brahma, Shiva and Vishnu on its lintel. Besides them are shown Ganesha and Kartikeya on either side. All these five gods are enclosed inside a makara torana. Two perforated stone slabs are on either side of the door jambs. No dvarpalas are found on the jambs. Inside the garbha-grha is a small shivalinga. Its small size reflects the svayambhu (self-emanated) character as it does not protrude much from the ground level. Ranga-mandapa is supported on eighteen pillars including four central pillars. Benches with slanting back rests run across the mandapa. The fourteen pillars are in form of half-pillars supported on these banches. The mandapa has three openings, on north, south and west, all supported by bhadra-mukhas (porches). The mandapa would have undergone major changes as inscriptions talks about gifts of pillars in about thirteenth century CE. The ceiling of the ranga-mandapa is divided in twelve parts and each part divided into twelve compartments. All ceilings are decorated with hanging lotus buds except north-western part. That part of ceiling is decorated with a sculptural panel depicting Ashta-matrikas and Shiva as Gajantaka in center. Ashta-matrikas are Brahmi, Kaumari, Indrani, Lakshmi, Maheshvari, Varahi, Chamunda and Yami (?). Few loose sculptures are strewn in the ranga-mandapa. 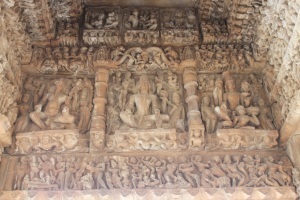 These are Uma-Maheshvar, Surya, Mahalakshmi and Vishnu. Sculpture of Vishnu is very unique and interesting as he is shown as a devotee of Shiva. He is shown with six arms, four intact and two broken. In his two arms, he is shown holding gada and chakra. In other two arms he holds a shivalinga. This image shows influence of Virashiavism where ishtalingas or jangamas are of much importance. This image illustrate that even Vishnu worship ishtalinga and thus proclaims Virashaivism. Henry Cousens tells that it is possible that the temple was built as a Vaishnava shrine, later moved to Jains who chipped away all the images, and at last it fell to Lingayats in whose control it is at the moment. The god is referred as Siddheshvara in all Chalukya inscriptions. Since the Suenas, the god is referred as Svayambhu-Siddheshvara. The earliest inscription mentioning the temple is dated 1109 CE however this is not the foundation inscription, therefore it can be safely assumed that the temple was constructed in last quarter of eleventh century CE. In the same complex, on south of the Siddheshvara temple is another temple dedicated to Narasimha incarnation of Vishnu. An exquisite image of Narasimha adorns the garbha-grha. How to Reach – Haveri is a town of considerable importance and a district headquarter as well. It is well connected with other major towns of Karnataka. It lies 75 km from Hubli, 74 km from Davanagere and 334 km from Bangalore. Haveri is a railhead and major bus station. Nearest airport is Bellary, 267 km far. Haveri has good options for accommodation and lodging. Filliozat, Vasundhara (1994). Nalapuri alias Haveri and Siddhesvara Temple published in Pandit N R Bhatt Felicitation Volume. Motilal Banarasidass. New Delhi. ISBN 8120811836. Nagaraja Rao, M S (1969). Sculptures from the Later Cālukyan Temple at Hāveri published in Artibus Asiae vol 31, no 2/3.